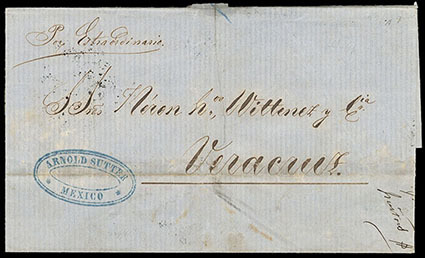 Mexico, 1864, Eagle (1st Period), ½r brown, Veracruz, large to huge margins all around, tied by perfect strike of "Veracruz, Junio, 6" cds (Schatzkes 1757A) on 1864 folded letter sheet to Mexico City paying the circular rate, with docketing noting "Circular" confirming usage, Extremely Fine and choice; with 2002 M.E.P.S.I. certificate. Scott No. 19 Estimate $7,500 - 10,000. 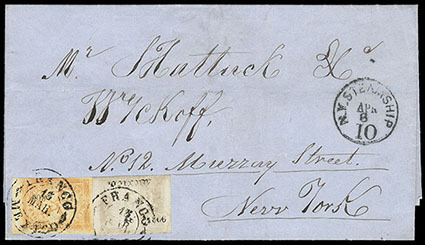 A SPECTACULAR AND UNIQUE USAGE OF THE 1864 ½ REAL FIRST PERIOD EAGLE ISSUE PAYING THE CIRCULAR RATE. 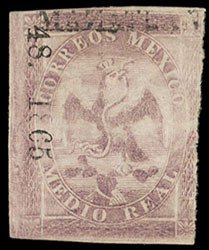 Mexico, 1865, Eagle (4th Period), ½r lilac, Mazatlan, cons 48-1865, without gum, Fine, this extremely rarer invoice of only 21 stamps was sent to one individual as a courtesy by the government, none of its stamps are known used or on cover (value code J $600-1000). 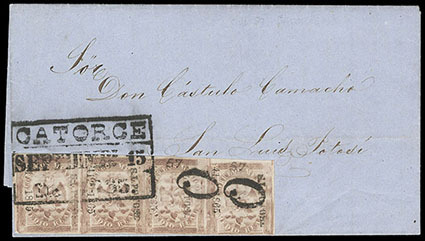 Mexico, 1865, Eagle (4th Period), ½r lilac, horizontal strip of four, San Luis Potosi, cons 41-1865, sub 57, tied by bold 1865 Catorce boxed date stamp (Schatzkes 1472) with additional fancy "O" handstamps cancelling right two stamps, on folded letter to San Luis Potosi, Very Fine and choice, a beautiful usage; with 2000 M.E.P.S.I. certificate. Scott No. 20 Estimate $1,500 - 2,000. Mexico, 1866, Eagle (5th Period), ½r gray, cons 48-1866, in combination with 1866, Eagle (5th Period), 2r orange, cons 52-1866 on 1866 folded letter to New York City, tied by Mexico cds with "N.Y. Steamship, 10, Apr 8" integral rate cds applied upon arrival, Very Fine, less than ten covers are known with the 2½ reales rate to the U.S.
Scott No. 20d+23 Estimate $4,000 - 6,000. AN EXTREMELY RARE FIFTH PERIOD EAGLE COMBINATION USAGE TO THE UNITED STATES BEARING THE GRAY MEDIO ISSUE. Mexico, 1864, Eagle (3rd Period), 1r ultramarine, Saltillo, cons 181-1864, horizontal strip of 4, full o.g., wide margins, Extremely Fine, a scarce and choice multiple, with only 220 sent. Scott No. 22a Estimate $250 - 350. 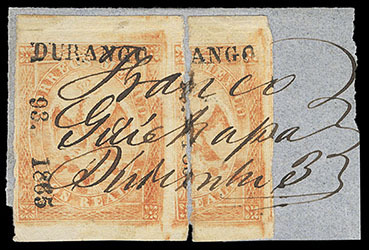 Mexico, 1865, Eagle (4th Period), 2r orange, Durango, cons 93-1865, in combination with 1865, Eagle (4th Period), 2r orange, vertical bisect, Durango on small piece, tied by manuscript Guichapan cancel (Schatzkes 259B), Very Fine and choice, just a handful of bisects exist (Scott catalog value $6,000 for bisect on cover). Scott No. 23, 23e Estimate $600 - 800. 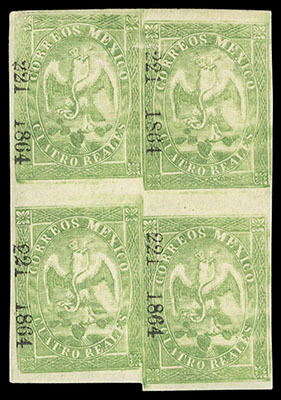 Mexico, 1864, Eagle (3rd Period), 4r green, without district name (Victoria), cons 221-1864, block of 4, full o.g., margins clear to large, fresh and Very Fine, 500 sent and 294 remained unsold; with 2015 G. Todd certificate. 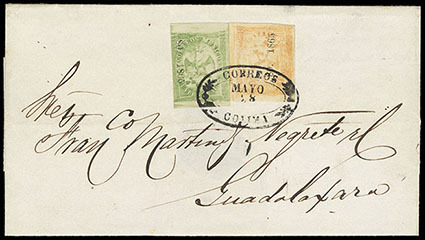 Mexico, 1865, Eagle (4th Period), 4r green, Colima, in combination with 1865, Eagle (4th Period), 2r orange (Colima), both cons 80-1865, tied by oval Colima handstamp on 1865 folded letter sheet to Guadalajara, reverse with matching "6" rate handstamp, Very Fine and choice. Scott No. 24+23 Estimate $200 - 300. 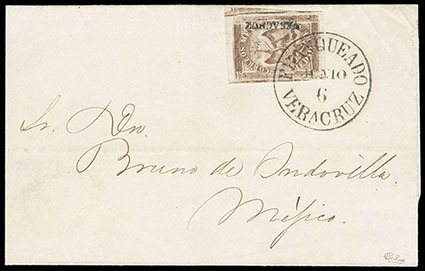 Mexico, 1866, Eagle (5th Period), 4r green, Mexico, cons 64-1866, tied by "Mexico, Abr 1, 1866" cds on reverse of folded letter sheet to Veracruz, manuscript "Por Extraordinario" endorsement at upper left; some light aging, F.-V.F. Three cities, Mexico City, Puebla and Veracruz, had express services between them. Cost was double rate. Very few covers have survived, most with 4r rate. 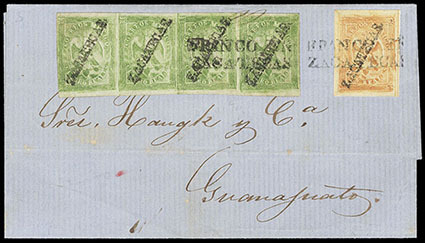 Mexico, 1864, Eagle (1st Period), 4r green, Zacatecas, horizontal strip of four, in combination with large margin 1864, Eagle (1st Period), 2r orange, Zacatecas on 1864 folded letter sheet to Guanajuato, tied by two-line Zacatecas postmarks (Schatzkes 1851A), strip additionally tied by light manuscript at top, Very Fine and choice, a wonderful 18 reales rate cover, illustrated in Pietsch (page 415); with 2001 M.E.P.S.I. certificate. Scott No. 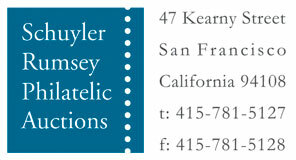 24a+23b Estimate $4,000 - 6,000. THE LARGEST KNOWN MULTIPLE OF THE 1864 4R EAGLE ISSUE ON COVER.